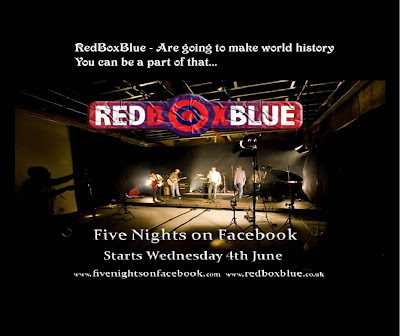 Facebook is live streaming its first concert tonight as RedBoxBlue create a live performance through their Facebook Fan Page - immortalised under the banner of 'Five Nights On Facebook' (www.fivenightsonfacebook.com). RedBoxBlue are a rock group from London (www.redboxblue.co.uk) and tonight (4th June) marks the first of five consecutive days of live performances through the RedBoxBlue Facebook Fan Page. RedBoxBlue will perform at 8pm every night from Wednesday to Sunday this week with extra Sunday sets at 11am and 3pm for followers in other time zones. 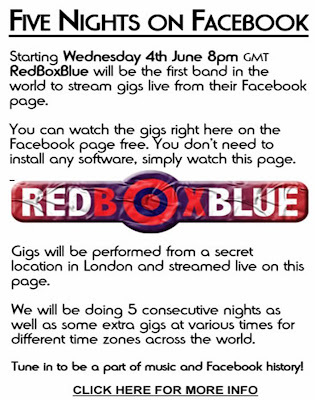 The gigs are being played at a 'secret' South London location and are broadcast through a streaming application on the RedBoxBlue Facebook Fan Page. Whilst this is not the first time musicians have used social networks to gain a wider audience (remember Sandi Thom?) and not the first time that a live concert has been streamed through a social network site (eg Operation MySpace http://www.nickburcher.com/2008/03/myspace), it is the first time that live music has been streamed through Facebook. Using Facebook in this way has gained the band media attention and gives them a significantly better chance of being noticed. Facebook Fan pages have been popular with musicians (http://www.nickburcher.com/2008/05) and some of the biggest Fan Pages (by number of fans) belong to acts like Daft Punk, Linkin Park, Chris Brown and Justin Timberlake. If the technology employed by RedBoxBlue works successfully then Facebook Fan Pages could become an important part of communication with fans - and not only can this mechanism be used for live music performance, there is no reason why bands / people / organisations cannot broadcast live streamed messages to their Facebook fanbases? Facebook may have just accidentally stumbled on an appealing way for users to engage with Facebook Fan Pages?